The basic unit of time in a game of Magic is the turn. This is something that often gets overlooked because of all the actions a played may take during a turn. There are only two “must” actions: drawing and discarding. Everything else- attacking, blocking, playing spells, and playing lands- are things that are allowed, but not required. How a player uses these turns dictate the outcome of a game. This statement seems fairly intuitive, but understanding it is vital to what I will be discussing in this article. There are two types of turns: actual and virtual. This article will concern go into detail about using virtual turns to your advantage. Before going any further, I need to discuss an underlying concept that will be very important in this article, and that is the concept of Work. Work is an idea that is heavily based off of Mike Flores' concept of Velocity; if you have not read his article on it, I suggest you do so at your earliest convenience. Work is the concept of taking an action during a game with an implied direction. 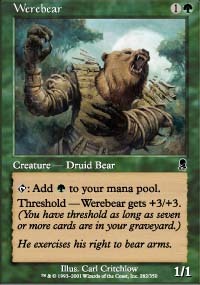 This can be as simple as drawing a card and bouncing a creature or more complex- filling a graveyard to give your Werebear a permanent Giant Growth. This direction helps affect the state of the game in the form of a virtual spell- an occurrence in the game that is not cast but does occur. The Werebear example above shows how work creates a virtual spell (even though it is part of the original card). Orzhov Blink made great use of these virtual spells by playing creatures that were not only beaters, but also spells, and in that deck Momentary Blink would often play the role of two spells (albeit at the occasional loss of tempo). 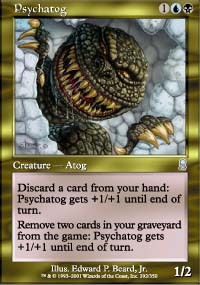 Moving away from PDC for a moment, let us take a theoretical deck that runs Psychatog and Quirion Dryad much like the Vintage GAT Decks. These decks do an immense amount of Work. Each spell cast will have the additional result of either growing the Dryad or becoming eventual fuel for a lethal 'Tog. It is this basic concept of synergy upon which Work is based- and work can either be qualitative or quantitative. Qualitative work is the extra actions, such as the placing of a +1/+1 counter on the Dryad, or the Madnessing of a Fiery Temper while giving Wild Mongrel protection from Dark Banishing and swinging in for three- you are increasing the quality of the cards through action. Quantitative Work is much simpler- it is any basic action that improves your game state, such as drawing cards, playing land, or draining life- anything that can be easily dealt with in simple numbers. The Mongrel example above, while being made up of Quantitative pieces has an overall result that is outside the numbers, resulting in a movement in Qualitative Work- there is a change in the qualities of the parties involved as well as a growth in numbers. Work can therefore be understood as the underlying actions that drive the action of a game, with basic actions being Quantitative and the more complex ones deemed Qualitative. Qualitative Work is important, as I said, because it allows a deck to play more “spells” than physical cards. This concept helps to make decks such as Orzhov Blink and Madness builds popular and effective in PDC. These decks are able to do multiple actions with one unit of Work. Blink piggybacked spells on to its creatures, and then used the eponymous card to do the work of multiple spells; the Blink creature as well as a Shelter. These decks also tend to rarely have dead cards, as even excess land in hand can often prove vital (again, pumping a Mongrel). This concept helps to show why Gathan Raiders can be such a house in PDC. The card does Qualitative Work all by itself in that in performs an action (un-Morphing) while growing larger (to a 3/3 or 5/5) and an act as an enable for other Working pieces of a deck. The Raiders create the opportunity for numerous extra spell-like actions to take place without the actual casting of a spell. If Work can be classified as the actions that drive a game, with Quantitative being defined as those basic actions, then it can be said the Qualitative Work are all actions that arise as the result of another action- free, conjured as it were, actions. These actions represent opportunities to advance your own game- as is the case of Blink on a Blind Hunter or using the ability on a Gravedigger or Grave Scrabbler or deny your opponent an action in the case of Psychotic Episode. These opportunities are free spaces of time in the game that are created through action- extra time created to further the goal of winning the game. This article, however, is not about Work, it is about creating and utilizing Virtual Turns. As mentioned above, Qualitative Work can create free time- time when you would not normally be able to cast a spell. Repeating these actions often enough can create not only free spells, but entire free turns. Looking to PDC Standard, you can see this played out in the popular Rebel engine. Amrou Scout is able to, if unmolested, cast creature spells at the end of an opponents turn. We all know that this is good, but it in effect creates an extra main phase during an opponents turn. The same is true for Instants and cards with Flash; they create windows for you to advance your game on conjured time. This is not enough to create free turns, however- there has to be another aspect. Again, returning the PDC Standard, there is the mechanic of Suspend. Suspending a Keldon Halberdier turn one is investing an early turn for later returns. In essence, by throwing away what could be a dead turn in a deck, a player can create two turn fives by having Hal come into play along side another spell, such as Steamcore Weird. Combining these two temporal cheats of Rebels and Suspend will allow you to have two turns fives without spending any resources on your own turn. Hal comes into play on your upkeep and then at the end of your opponents turn, you are able to Scout out a Rebel; two turn fives- a Virtual Turn. There are other ways to create Virtual Turns that are not contingent on Work. Instead, these Virtual Turns are created through tempo. One reason Remand is such a powerful card is that it wastes an opportunity that your opponent has taken to spend resources and at the same time advances your own plan through drawing a card. You have lost nothing while your opponent has to replay the same spell. PDC, however, does not have the powerhouse that is Remand. Instead, PDC has the basic building blocks of constructed Magic. Also, the scenarios described here are not the same as the Virtual Turns created through Work because rather than accelerating the antagonist a turn, tempo based virtual turns decelerate the opponent a turn. 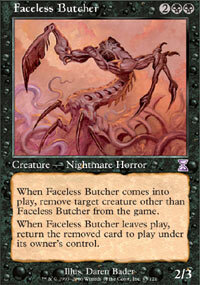 This can be seen most easily in the recently popular play of a land destruction spell on a Ravnica block bounceland. Paupers were often running these cards out on turn two or three, before their game plan had been established on board. 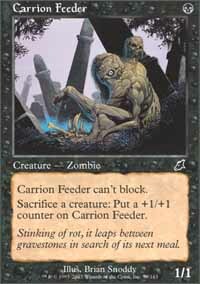 The decks that utilized the so-called Karoo's to their fullest often dominated the late game and cared little about the early game. Stone Rain became a powerful tool in fighting these decks because if used properly, it fit into the aggressor deck's curve while setting back the slower deck almost two whole turns (one for the bounced land and one for the destroyed land). It was not always Stone Rain however, Temporal Spring accomplished the same thing, only it also denied a draw step to the late game player. The time bought- the turns denied- would often be enough to allow the aggro deck to polish off the slower deck before they could come online. Other cards, besides land destruction, can accomplish the same task of denying turns. Duress is a highly played card in PDC. While not stealing a whole turn, it does deny a resource and therefore a possible turn. Duress is not as powerful in PDC as it is in other formats, however. 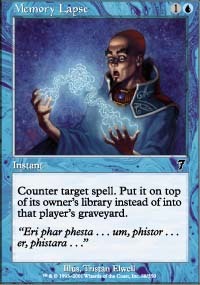 This is mostly due to the redundant nature of the spells it is able to nab in most PDC decks. It is still a good card and a powerful tool to deny potential turns. An underused card in the format is Memory Lapse. Its creature cousin Chittering Rats sees play, mostly because it can beat down and be reused, however the Lapse can be far more devastating. Much like Remand, it can totally negate an early turn. Casting the Lapse on turns two through four is akin to taking an extra turn in PDC because it has exhausted opposing resources while the caster has lost no tempo, denying the defender a turn. Virtual Turns can be created by two means; Qualitative Work and Tempo. Qualitative Work can actually generate these turns where as Tempo takes them away from an opponent. Regardless of how the turns are constructed, they allow for the player who is ready to use them to take full advantage. These turns, while virtual, allow for actual chances to advance a game plan- they allow chances fro a player to take extra actions. This is important because the player who has the chance to further advance their game plan has a greater chance of winning the game. Think back to the opening of this article where the game of “Draw, Discard, Go” was described. If one player was able to have one creature in his or her deck, and have it in the top ten cards, the action of casting that creature would be a game breaker. The opportunity arose for an action to take place, and the player who took it was able to win. This is a gross exaggeration, but it is applicable to PDC. Looking at current Mono Blue Control decks that win by denying the other deck a chance to take action, we can see this theory in action. MUC seeks to create virtual turns by taking actual turns away from an opponent. Additionally, the Affinity mechanic on Spire Golem allows MUC to have additional turns on the turn it drops a Golem. On turn four, it is able to generate one extra turn and on turn six and later, two extra turns- or rather, chances to deny turns. MUC denies actions until it takes the few it needs to dominate the game. RG Thresher, a new creation that I used to recently win a PDC Euro event, generates virtual turns pro-actively. By combining Madness, Hellbent, and Threshold, this deck is able to do Qualitative Work and create virtual spells that advance the deck's game plan. A key component of this deck is Stone Rain, which is used pro-actively to deny tempo. Additionally, the cards work in cohesion to create the virtual spells of Hellbent and Threshold giving the deck a distinct temporal advantage. The aforementioned decks use the concept of Virtual Turns as a mean to control the speed of their own victory- Virtual Turns help to dictate the speed of the game. Let us take a theoretical Orzhov Fiends deck that contains the Nightmare creatures from Torment- Faceless Butcher and Mesmeric Fiend. This deck plays Carrion Feeder and Nantuko Husk as well as Whitemane Lion and Pit Keeper. It supports these cards with Orzhov Signet, Choking Sands, Grim Harvest and Vulshok Morningstar. This deck thrives on Virtual Turns. It utilizes the Signet and the Sands to accelerate its own tempo and disrupt that of the opponent. Yet this is supplemental to the Work that the deck does. Using the stack, it can grow one of its creatures while also permanently removing creatures from play and cards from hand while simultaneously growing creatures for a large attack. The Keepers allow the deck to recycle the Working components to continue taking Virtual Turns. In the late game, it can use the Harvest to continue along the game plan and do additional Qualitative Work- “drawing” spells to remove cards in hand and creatures from play while making a large threat. The Lion also does work, doing similar stack tricks and also acting as a Shelter, saving a creature. This deck, while fragile, is a great example of a way that Qualitative Work and Tempo combine to create Virtual Turns and how those turns could be used for victory. Not only does it deny resources through the Sands and Fiends, it also creates virtual spells for the Husk and Feeder to turn them into imposing red zone threats. Chances are this deck would be too fragile for competitive PDC play, but it is an ideal example of how Work and Tempo can create Virtual Turns. This Fiends deck using these turns to recycle threats and dominate the game, showing how these principles, when used in concert, can be used to gain an advantage that can win the game. Virtual Turns are part of PDC and part of Magic in general. Because PDC lacks the major tempo swings other formats afford (such as Wrath of God and Fact or Fiction), these small incremental advantages may be the most important ones available to the PDC community. Exploiting these advantages is beneficial as over the course of a game turns upon turns can be gained, and he or she who takes more turns has more chances to win the game. Even if only a few of these chances are taken they still advance you on the path to victory, and this is the power of Tempo and Work and the value of Virtual Turns. A good, informative article, though it was a little dense. Some sort of graphic representation of what you were talking about might have helped, maybe? I understood it better after Evu's post. Thank you Evu- do you have a back ground in math? I only ask because I have a bachelors in English, where being overly verbose can be seen as a good thing. Evu really hit the nail on the head with what I was trying to get at, I used the terminology I did because I felt it best represented what I was trying to discuss (at the time of writing). Looking back, it is a touch dense and another few days of work would have made the points clearer. Actually, I think the "didn't read it" comments, while perhaps not particularly constructive on their own, illustrate a valid point. All this talk of "virtual turns", "virtual spells", "virtual card advantage", etc. is a complicated way of expressing concepts that would be easily understood if they were phrased in more familiar language. If I understand correctly, the basic message here is this. Magic is a game of resource management. Players use their resources in order to achieve some beneficial effect, and obviously the player who generates the most beneficial effects is going to win. When a resource goes unused, or when it is used but produces effects that are less beneficial than they could be, that represents a missed opportunity. If the resource is a card, you can always use it later. But if the resource is a turn, or an untapped land, you have to use it every time it becomes available, or else it'll disappear and be wasted. Madness spells are an excellent example. You can discard a land and give your Wild Mongrel +1/+1. Or you can cast Ghostfire and do 3 damage to a target. Or you can discard Fiery Temper to Wild Mongrel and get *both* effects out of one card, all while holding the extra two mana back to pay for Rune Snag or something. Despite the writing being a little obscure, I think this is a very important concept for Magic players to grasp, and a great idea for an article. it was good. I was just being sacastic. I couldn't finish this article..There was too much work invovled to do so. Yeah, I lost interest after you defined work. If one actually reads the entire article (as I did) the information is pretty solid.